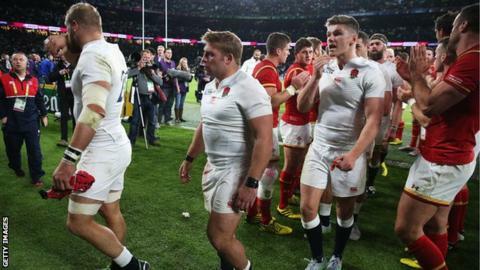 England's crucial World Cup match with Australia is "as big as it gets", says England assistant coach Andy Farrell. The hosts' hopes of making the quarter-finals will effectively be over if they lose on Saturday, following their 28-25 defeat by Wales last weekend. Stuart Lancaster's England team have been heavily criticised but Farrell denied that the side lack on-field leadership and rugby intelligence. "For 55 minutes we were on top and played good rugby," he said. "We're all devastated with the result and we need to understand the reasons why and learn the lessons. "But we've moved on to Australia quickly. It's full steam ahead and this should be the best week of the players' lives." England, who led 22-12 with 30 minutes left, opted not to attempt a late penalty that would have secured a draw in their second Pool A game. Captain Chris Robshaw, after consulting with team-mates, instead chose to kick for a five-metre line-out as England pushed for a match-winning try. Asked if the side are lacking on-field leadership, Farrell told BBC Radio 5 live: "No, we're not. We meet the leaders twice a week, we're growing in that area, developing all the time and happy with where we're at. "Whatever decision is made, you can make it a good one or a poor one with your execution and we weren't quite good enough. "This game against Australia is as big as it gets and we're desperate to give a performance and be worthy winners." England prop Joe Marler says the team have reviewed their performance but will not dwell on the Wales defeat. "We let ourselves and a lot of people down but we have to concentrate on the job in hand - we can't afford to sulk," he said. "The review was honest, as they always are, but we've moved on. The game is done, we lost. "This is now the biggest game of our lives. We're already excited and the boys want to play."